Join us at the second Annual Fine Arts Festival at Danville Community High School, April 13-15. 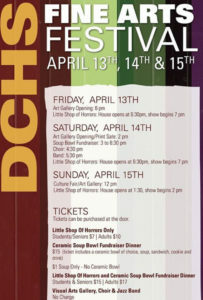 Mark your calendars for April 13th-15th and come to DCHS to enjoy an awesome weekend full of theater, band, and choir performances, an art gallery with art from ALL DCSC schools, a print sale, and a soup bowl fundraiser! Tickets are available at the door for all events.